Ten Of Cups: “The spiky scent of lavender lightly veils the deeper, sweeter notes of rose. Their essence is carried into the air on spirals of steam. Underneath, the earthy, rich smell of frankincense fills in the empty space. The air is permeated with peace and love and promise. 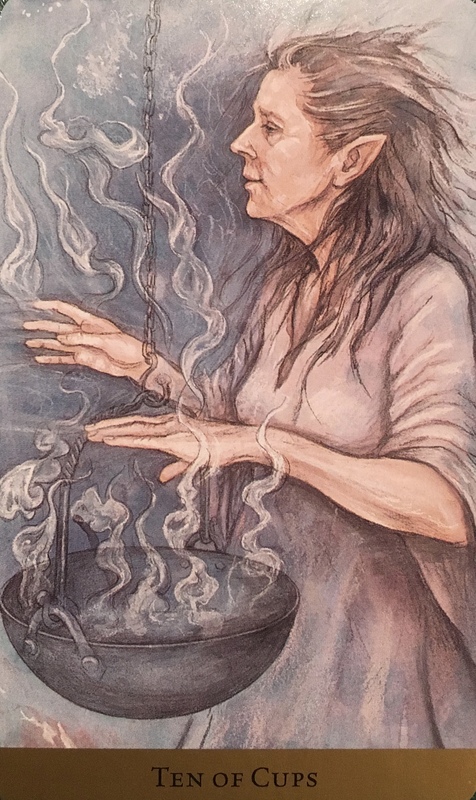 Calling on the spirits of the plants, which she harvested with her own devoted hands and blended together in water gathered from her own blessed spring, she invites them into her life. She sings their songs, and as they release their magic, they sing with her. In that moment, powerful magic is present. This card represents a coming together. It also tells of the tiny moments that make up an abundant life; those lazy afternoons spent with family in the back yard, or a walk with a friend. It is a reminder that there is so much to be grateful for that is untangible, fleeting and precious. A smile or hug from a loved one. A cup of tea and a heart to heart visit. Holding hands. Gazing into someone’s eyes. Admiring the deep blue of the sky or the sea. Feeling your toes in the sand or the wind in your hair. Doing what you love to do, mindfully, without a rush. Feeling love in your heart, filling it right up to the brim and letting it spill over. Connect today. Make it a little more special. Reach out. Get outside. Surprise someone with a call or a hug or a smile. Give of yourself and pay it forward.